“Caminantes, no hay caminos, hay que caminar.” — Travelers, there are no roads, but we must go on. In 1985 Luigi Nono spied this medieval inscription on a monastery wall in San Francesco di Toledo. It would serve as motto for a group of austere, timbre-driven pieces he did late in life. The last was a 1989 violin duo, “Hay que caminar” soñando — “But we must go on” dreaming. The reissue, a week apart, of the best-known accounts offers me an excuse for discussing a favorite opus. It’s unclear where Nono might have ventured after this, but its conclusion is a memorable leave-taking — 12 seconds of silence as the bow remains in position (con arco fermo). As in his string quartet, Nono takes the “enigmatic scale” Verdi utilized in the Ave Maria of Four Sacred Pieces (c, d-flat, e, f-sharp, g-sharp, a-sharp, b, c) for the launching point. It’s quoted on the title page and the rising, then falling curve is clearly audible at the start, its final note allowed to die in a void. This succession of fragments is a textbook lacunary body — its gaps are part of the organism. Development is denied, so color considerations are paramount. 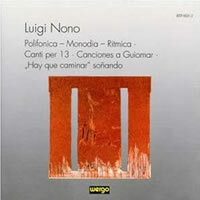 Nono summons every kind of legno, ponticello and high-harmonic effect; the sound resonating at the end is crini / legno, the horsehair and wood of the bow hitting as one. However threatened isolated strands may seem, the overall arc is secure and gripping. It’s a minority view, but I find caminar superior to La lontananza nostalgica utopica futura, its 1988 predecessor. The scope is refined. Gone are the pile of equipment (eight channels of prerecorded material, each feeding a loudspeaker, with a “master of levels” monitoring the mix) and open form. Nono’s “unplugged” palette does reflect his electronic oeuvre by extending, highlighting or modifying tones. La lontananza’s spatial concerns also remain in reduced terms. Each player’s score is distributed among three music stands in different spots (down from the earlier work’s “eight to ten”). Irvine Arditti leads the Arditti String Quartet, which devotes itself to the modernist idiom (Berg is early music). He and David Alberman (the second violinist) premiered “Hay que caminar” soñando on October 14, 1989, in Milan. Gidon Kremer is a star soloist equally capable in solo Bach and Gubaïdulina, Schnittke or Silvestrov. 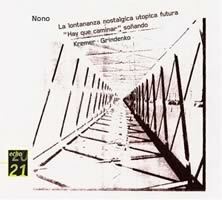 He collaborated with Nono on La lontananza nostalgica utopica futura. Andreas Bräutigam and Stephan Kalbe belong to Ensemble UnitedBerlin. In addition to a “Hay que caminar” soñando taping, they went on to reprise it in a May 2000 concert. Young violinists Joanna Becker and Clemens Merkel have often appeared as a duo. Tough to bring off but never coddling the virtuoso’s ego, “Hay que caminar” soñando is demanding for musicians and audience. Dynamics go down to ppppppp, and figures often have to be generated from a standstill. No combo has committed it to disc casually. I’m not even a lapsed audiophile, but here sound matters more than it does while deciding between Pollini’s and Ashkenazy’s Chopin Études. The caminar discs can be categorized by venue. This is the clearest window yet on the piece. Arditti and Alberman send the gestures more distinctly and subtly into space than the others do, and are provided a recording with ideal delicacy and dynamics — the music’s true arena. One of the key events here is the unison passage beginning the finale. The players are phenomenally together but also different, as components in a top string quartet would be. The best, they say, is the enemy of the good. This team understands the requirements, but its tone (in ensemble or separately) is a bit too blunted for the job — the spidery lines and vapor-trail harmonics cut too wide a track. The soundstage puts the executants quite close to each other, and the softest dynamics aren’t achieved. Kremer’s history with the composer matches Arditti’s, but their routes seldom intersect. I need both. Icy purity isn’t Kremer’s game; his instrument is the rapier, not the scalpel. He and Grindenko tear into the jagged outbursts with real ferocity, and signpost the shards of the original scale. As a result, the work is rendered less avant-garde, more related to other Kremer efforts. DG’s big-boned sonic image complements the extrovert slant. The violins are situated farther apart than on the above CDs, which elucidates the crossed rhythms and entrances. Becker and Merkel boast major chops; harmonic traces and biting reiterated attacks are thrillingly steady. If they don’t haul the narrative thread quite as taut as the Arditti and Kremer readings, they are more sheerly beautiful than either. A striking alternative to the big names, to which I return often. 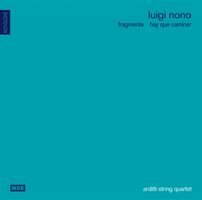 If you can snag only one of these, Fragmente – Stille, an Diotima, Nono’s 1979-80 string quartet, may swing the balance. “Arditti didn’t interpret the piece, they realized the music I intended,” the composer told Lachenmann. So dominant is the Arditti’s view that only a cursory live run-through has been issued since. Conventional opinion has Nono turning away from his political and serial past after 1980. Peter Hirsch disagrees, and his Wergo program illustrates a basic continuity from 1951 to the duo. (Polifonica – Monodia – Ritmica, Canti per 13 and Canciones a Guiomar reveal steps along the journey.) Fluent playing and singing clinch his point. Kremer’s realization of La lontananza in its initial state is an important document. (Nono expanded it by a third following the premiere.) My sole complaint is that separating a live Kremer from the squad of prerecorded Kremers is next to impossible. The violinist’s note on the work’s labor pains is witty and essential. 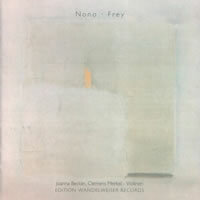 Next to Jürg Frey’s monomaniacal ohne titel (2 violinen) of 1995-96, Nono’s duo sounds like Carmen. Frey restricts himself to episodes of identical matter. The beginning stanzas seem more bamboo flute and alphorn than violin, but a few plucks assert the instrument’s usual vocabulary. Tremolo runs ensue, then a remorseless stretch of simple phrases. I can admire the players’ focus. Verge (http://www.vergemusic.com/), a superb Ontario mail-order outfit, has the Edition Wandelweiser disc. The Wergo can be had from Amazon.de.